Champagne sales are set for a record year, driven by solid demand from export markets, favorable currencies and stabilizing sales in France, the fizzy drink’s home market. Industry estimates gathered by Reuters showed that about 312 million bottles of the prestige sparkling wine will have been dispatched in 2015, a rise of between 2 and 3 percent from 2014. Revenue has risen 4.4 percent to 4.7 billion euros in 2015. In 2007, the record year so far, revenues reached 4.56 billion euros, before the global economic and financial crisis began weighing on the market a year later. The 2015 sales estimates reflected efforts to promote higher-priced products such as special blends and fine vintages, as well as growing demand for Rose Champagnes in Japan and the United States, Champagne’s second export market after Britain. Economic woes in Champagne’s home market of France have taken the fizz out of global sales since 2010, but sales were stabilizing in volume and value this year and could even show a slight rise. “France is on a recovery path. Consumption stabilized,” said Bruno Paillard, CEO of Lanson BCC (LAN.PA), the number two Champagne house behind luxury group LVMH (LVMH.PA). Sales were improving in French hypermarkets as well as in specialized stores. “Consumers need to enjoy life,” said Paillard, adding lower energy prices and interest rates may have helped improve consumer purchasing power. The Champagne market is dominated by LVMH, which owns the Dom Perignon, Moet & Chandon, Veuve Clicquot, Ruinart and Krug brands. Specialist makers include Lanson-BCC, Vranken (VRKP.PA) or Laurent Perrier (LPER.PA) as well as drinks group Pernod Ricard (PERP.PA) with its Mumm and Perrier-Jouet brands. Official figures for 2015 will be published next month. 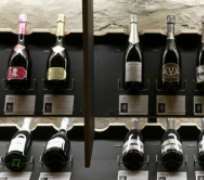 Champagne, which can be produced only in the region of the same name, is facing tougher competition from Spain’s cava and Italy’s prosecco, sold for as little as a third of the price.